James Watt and Martin Dickie are known by some as the Scottish craft beer junkies whose escapades have been chronicled on the TV show “Brew Dogs,” which debuted in 2013 on Esquire Network. Now the partners are bringing their collection of BrewDog beers, along with their irreverent marketing, to the U.S. with the planned launch in February of a 110,000-square-foot brewery in Columbus, Ohio. Watt and Dickie, along with their dog, started BrewDog in 2007 in northeastern Scotland after becoming bored with industrially brewed lagers and stuffy ales in the U.K. They started brewing their own beer, selling it in local markets and out of the back of a van. That project grew into a global company producing a wide range of craft beers with an emphasis on quirky marketing. At one point, for example, BrewDog sold a high-alcohol beer in bottles made from dead squirrels, fusing the “seldom-colliding world of art, craft beer and taxidermy,” according to its website. 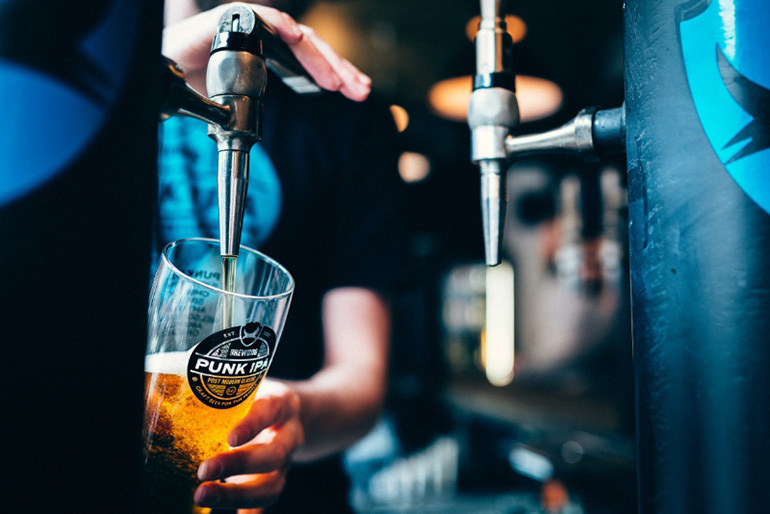 BrewDog operates about 50 breweries and pubs throughout the U.K. and eight other countries, but the company is betting big on Americans’ growing love for craft beer – quite literally. BrewDog has funded its U.S. debut in part by offering equity shares to the public. Investors, or “Equity Punks,” as the company calls them, can buy in for as little as $95 for two shares, though the average investment is about $420, says Watt, who serves as CEO of BrewDog USA and captain and co-founder of BrewDog plc. The company has pledged to bring a brewpub to any city that corrals at least 500 investors. BrewDog beers are coming to a 110,000-square-foot brewery in Columbus, Ohio, in February. So far, about $3.5 million has been raised in the U.S. and the opportunity is available through February. About 20 percent of the U.S. division will be sold to the public, but most of the investment in the U.S. expansion will come from the parent company. Meanwhile, the partners plan to add another layer of risk. U.S. investors will have the opportunity to double their stakes – or lose them – when Watt and Dickie bet the investment on a roulette table at a casino to be determined in February. Investors can choose whether to participate, or contribute only some of their shares to the bet. Even if they lose their shares, they’ll get to keep the benefits of being a punk. Win or lose, BrewDog is moving forward with its plans for U.S. expansion. With the brewery in Ohio will come the U.S. division’s corporate headquarters and two brewpubs, scheduled to open in 2017. BrewDog beers will be on tap and a Scotland-inspired menu will include salmon, venison, cheese and, of course, haggis, which might make an American-style appearance on pizza or in spring rolls, says Watt. Known for brands like Punk IPA, Dead Pony Club and Jack Hammer, BrewDog beer was once available in cans in the U.S., but the made-in-Scotland product wasn’t as fresh, so the company pulled the product from U.S. retailers about two years ago. The Ohio brewery will offer a fresher supply for the company’s brewpubs, as well as providing BrewDog beer to other restaurants and bars, and at the retail level. Watt describes the company’s beer as a hoppy and full of flavor, representing a U.K. take on American craft styles, including IPAs, pale ales and imperial stouts, as well as high-alcohol offerings. Recently BrewDog began distilling whiskey, though the first batch isn’t expected to be available until 2020. Photos courtesy of Milly Jones (top) and BrewDog.